Published at DVHH.org 24 Nov 2018 by Jody McKim Pharr. >>>>> "Hans was born in Batschsentiwan, near Apatin on the Danube, the "Land of the Danube Swabians", (in Hungary prior to 1914). As a child, he became a post World War II victim of ethnic cleansing in 1945 in Communist Yugoslavia. After his escape in 1947, he fled via Hungary to Austria and from there he came to the United States in 1956. After serving a tour of duty in the United States Armed Forces (1958-1960). He studied mechanical engineering and worked as a machine design engineer in the machine tool field and later as an engineering consultant in the steel mill industry. He married Annemarie Gibisch in 1961. They have two children Birgitt and Robert and three grandchildren Kris, Katie and Klayton. His involvement in the German-American community in Greater Cleveland began in 1957, when he became a founding member of the "GBU Soccer Club". In 1964 he became one of the first youth soccer coaches of the "Sport Club Donauschwaben" (formally GBU) and later Concordia." "Our beloved husband, father, Opa, brother and uncle, Hans Kopp, passed away on Friday, September 21, 2018 at the age of 83. Hans was married to Annemarie (nee Gibisch) for 56 wonderful years. He leaves behind his son, Robert, daughter, Birgitt Hacker, son-in-law, Ted, and grandchildren, Kris, Katie and Klayton, brother, Franz, and nieces and nephews, Paul Keyerleber, Michele Fitzgerald, Franz Kopp and Elisabeth Clift. He was preceded in death by his daughter-in-law, Christa Kopp. 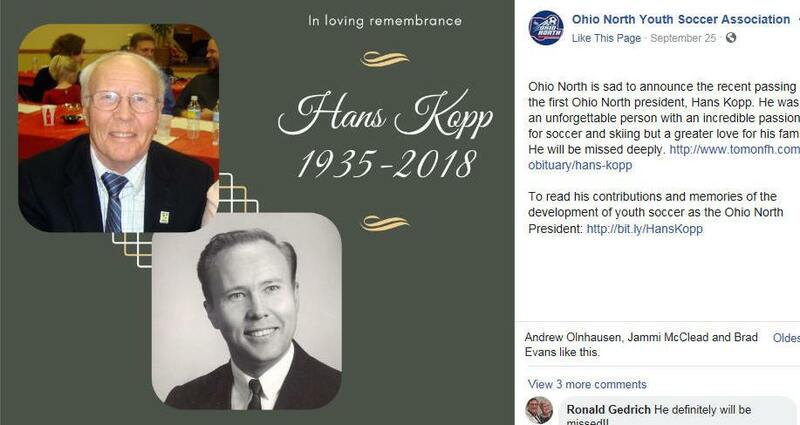 Hans loved to tell a good story, about his days in the US Army, about his skiing adventures, about helping to found the Ohio Youth Soccer Association, about his childhood in Batschsentiwan, Yugoslavia, and mostly about his children and grandchildren. His loves were his family, especially his beloved wife, Annemarie, whom he met while stationed in Germany during his service in the US Army, his beloved mountains, where he skied until just this past winter, all the young soccer players he coached, the dogs he had over the years, and chronicling his family history of the Donauschwaben. Hans, Dad, Opa, Onkel Hans – you are loved and you will be missed with all our hearts. You made this world a better place, you left us better people and your love will remain with us forever. Rest now in the peace of our Lord Jesus Christ.